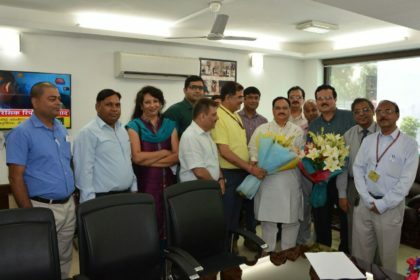 New Delhi: Just a few days after the resident doctors of the capital went to meet Union Health Minister, Shri JP Nadda to apprise him about the issues of young doctors and their concerns regarding the 7th pay commission, a meeting was held yesterday between the minister and the Senior doctors associated with the government to discuss their issues in detail. It is reported that this meeting was held between the minister and members of JACSDO( Joint Action Council of Service Doctors organization). This organization is the common representation point for many health organizations in the government sector including Central Health Services (CHS), Indian Railway Medical Services (IRMS), MCD, NDMC , Delhi Administration, ESIC and many other and is led by urologist Dr Rajeev Sood. While thanking the minister on the government’s latest directive of increasing the retirement age of doctors to 65, the delegation also apprised him the dissatisfaction in the medical fraternity with the recommendations of the 7th pay Commission, especially the one related to NPA. The minister asked the doctors to submit their demands, and it reportedd that the organization submitted a whole Charter of pending issues to the minister, highlighting not just the 7th pay commission, but touching upon various issues concerning the medical fraternity, including Indian Medical Services, Parity of pay, cadre review. Expedite the Creation of a dedicated Indian Medical Services (IMS) Cadre and until such time safeguard the dignity of Medical services by providing equated access to the entitlements of Class 1 & above Officers as provided for in other All India Services i.e. Promotions/Perks/Protocol. Nomenclature of CHS to be changed to Indian Medical and Health Services, in line with Indian Railway Medical Service and Indian Ordinance Factory Health Services (Other two organized Central Health Services) + different streams need to be re-designated. Regular Cadre Review is the integral part of any organized service. CHS is victim of apathy of Bureaucracy and in 60-years we had only 1 and half cadre review. Javed Chaudhary Committee: which was a scientific and survey based study. Focusing on needs oriented approach and was brought out after thorough study. The specific recommendation of promotion to JAG (SG) to SAG in 5 years against current 7 years. This shall compensate the late entry into service represented as demand of higher starting scale for service doctors (For late Service Entry). NPA to be 30% increase in functional HAG posts. Tikku Committee: The recommendation pertaining to the creation of a 5 member Medical Board as Cadre Controlling Authority and reinstate the authority of Director General’s office in this board. 5th Central Pay Commission: To follow the seniority and merger formulae was recommended in Chapter 53 for CHS, including lateral entry for PG Medical Officers. This shall pave way to the creation of Indian Medical Services. MOU of 1986 with Resident Doctors and Mr. T.N. Seshan then cabinet Secretary: To implement the MoU signed with reference to the fixation of relative salaries of Residents / Service Doctors in predetermined percentage. There should be parity with autonomous institutes like AIIMS, PGIs and public sector undertaking’ for research allowances and medical education up-gradation allowance. Enhance Non Practicing Allowance to 40 per cent of basic pay and restore its status vis-à-vis basic pay for all purpose, including computation of HRA and pensionary benefits. Rename NPA as Doctor’s Service Pay as its current nomenclature is misleading about its status as a part of basic pay. Reformulate the calculation of capping of Basic Pay+NPA to be nominally below Cabinet Secretary’s pay as decided in MoS between JACSDO and Govt. of India in 1989 as opposed to the practice of Calculation of average of pay of apex and CS pay. We propose that the Ceiling of salary may be set nominally below that of the Cabinet Secretary with a difference of a symbolic amount i.e. about Rs 500/-. Restore the functionality of DGHS by restoring all the 129 sections with staff originally under it. To encourage the appointment of Doctors only into Directorate and its managerial posts on a large scale for better utilization of their expertise at these responsible and specialized posts. Conveyance Allowance to Medical Officer should be mentioned as a separate entity and kept distinct from General Conveyance Allowance for other services as at present. The Conveyance should be renamed as vehicle maintenance allowance and should be given as per previous CPC’s recommendations as it is given to Doctors to attend any emergency beyond their normal duty hours and must be paid alogn with salary as a distinct entity completely linked to DA. To allow the grant of conveyance allowance along with the salary with a self –certification by the concerned officer and not insisting on the elaborate and exhaustive paper work/documentation as is currently sought. To encourage and ensure less paperwork for grant of other similar allowances, to make Self Certification sufficient grant of such allowances. The Security provided to the Doctors needs immediate review and it must be ensured that there are adequate provisions especially for lady doctors. Transport allowance must be 20% more than the existing as the number of working days have been increased to 6 days a week vis a vis 5 days for other services. The number of Casual leaves should be increased to a minimum of 14 per year as there is no provision for Saturday off (6 day week). Expedite the Recruitment procedure, 6 monthly DPC’s and Advance Seniority Lists as on First October of every year to fill the existing vacancies in various posts. The recruitment rules may also be reviewed to augment this exercise. There should not be any stagnation at SAG and HAG level. Around 3% of total Cadre posts to be HAG Functional posts as recommended by various committees and envisaged in the DoPT Monograph. To provide for Complaint Redressal Cells at the Departmental level, thereby avoiding unnecessary delays, Also the matters pertaining to the Professional Conduct of Doctors is to be addressed by the DOCTORS ONLY. Complaint against doctors should only be investigated by a Committee of Doctors. High Risk Allowance was given by MoU of 1989, but is yet to be implemented SPG is given @ 25% of the basic salary. Minimum Allowance up to Rs. 1 lac may be paid to attend conferences and other CME’s in a financial year. There should be ‘parity with autonomous institutes like AIIMSs, PGIs and Public Sector undertaking’ for research allowances and medical education up-gradation allowance. Each Doctor should be provided with data entry operator, where computerization has been done. There should be 3 level mandatory training of CHS Doctors as recommended by Tikku Committee. There should be adequate reserves created namely, Leave Reserve, Deputation Reserve, Training Reserve and Probationary Reserve as mandatory for any Organized Service. Leave reserve should also include additional 10% to 20% to accommodate CCL. PG allowance should be made as 10% of the basic salary. Bureaucrats must not head any department having doctors as defined by Supreme Court. No doctors should be allowed to work more than 36 hours a week at any cost because medical profession require extreme concentration, attentiveness and requirement and visiting outside duty hours. Numbers of patients must not be more than 40 per doctor per OPD day i.e. Doctor patient should be ensured. Therefore adequate vacancies should be calculated and created. Hi,im dr sagar,dnb jr of jagjivanram railway hospital mumbai,,sir can we get benefits of 7th pay or nt?bcoz hospital office staff is nt declaring clearcut picture as we r residents here…bt as state gov pg students gets benefit of 7th pay we should have to get…sir plz reply..and plz raise qt fr our payment.. Improve VII CPC recommendations. Revise Central Govt. employees wages immediately. In the face of the unprecedented rise in the inflation of the Indian Economy during 2006-16, the Central Govt. employees demanded the Government to affect wage rise, for the emoluments fixed on the basis of the 6th CPC was incapable of meeting the both ends of an employee. Though under threat the then Government conceded the demand for setting up of the 7th CPC, they refused to grant any interim relief or DA merger, which alone would have mitigated the difficulties of the low paid employees. When the NDA Government came to power, the NJCA & CCGGOO approached them also with a request that the difficulties of the low paid employees in Central Government must be appreciated and the demand for Interim Relief or DA merger be conceded. The NDA Government too did not respond to the plea made by the NJCA & CCGGOO. The 7th CPC was to submit its report in August, 2016. However, at the intervention of the Government, the report was further delayed and it ultimately reached the Government only in November, 2015. The report of the 7th Central pay commission was totally disappointing as it did not address any of the issues projected before them in a proper manner and most of the demands were rejected sans reasoning and logic. The increase they recommended was a paltry 14%, the lowest any Pay Commission had ever suggested. Except setting up an Empowered Committee of Secretaries, the Government did not do anything so far on the report. It is now more than six months the report is with the Government. Normally the revised allowances which form part and parcel of the salary of the employees are granted with prospective effect i.e. from the date of the issue of the orders. The delay in taking decision on the 7th pay commission report will rob the employees of the increased allowances for ever. The Staff side had been pursuing to have a meaningful negotiation and settlement of the issues. Except hearing the leaders of NJCA & CCGGOO, the empowered Committee did not go further. It acted as if it was powerless and the final decision will have to be taken by the Government. At the request of the Cabinet Secretary on 1st March, 2016 the strike action which was to commence in April, 2016 was deferred. The determination of the Minimum wage on the basis of Dr. Aykhroyd formula enunciated in 1957 to which the Government of India was a party is the most significant issue. A right settlement thereon will have far reaching impact in the wage determination of the entire working class in the country. The confrontation is between the forces who wanted India to be the destination for cheap labour and others who fight against the exploitation. The new Contributory Pension scheme introduced by the Government in 2004 has made one third of the Civil servants unsure of their entitlement at the evening of their life even though they were to contribute huge sums from their wages every month compulsorily. The PFRDA bill became an Act in the country as the members of Parliament both belonging to NDA and UPA voted in favour of the loot of the employees. Even the recommendation made by the Standing Committee of the Parliament to provide for a minimum guaranteed annuity pension was rejected when the Bill was passed. The other issue which must have a satisfactory settlement is about the contributory pension scheme. The new pension scheme is a curse on the employees. As far as employees are concerned, they are worried that in future they may be deprived of their pension in total. They are also worried that there is no guarantee of either family pension or gratuity as per 7th pay commission recommendations. Scrap the PFRDA Act and NPS and grant Pension/family Pension to all CG employees under CCS (Pension) Rules, 1972 & Railways Pension Rules, 1993. The one and only positive recommendation made by the 7th CPC was to provide some relief to the in the pension entitlement of the past pensioners. The Department of Pension & Pensioners’ Welfare has unfortunately recommended to the Cabinet Secretary that, even that recommendation must be rejected on the specious plea that the requisite relevant records might not be available. The central government employees are very much annoyed and anxious with the 7th pay commission recommendations. As there had been no fruitful negotiations or discussions and having realized that the Government has no intention to settle the Charter of demands, the NJCA & CCGGOO have served strike notices. The indefinite strike will commence on 11th July, 2016, if no satisfactory settlement is brought about on the charter of demands.All India DRDO Technical Officers Association requests Prime Minister to intervene immediately for improvement of VII CPC recommendations and revision of Central Govt. employees wages.